Selfish and self-centered, Justeen's cousin, Bessie, inherited the operation of the Crawford Pinecrest Plantation and Rockmore Castle in Jacksonville, FL. An old maid at four and twenty, Bessie from Tallahassee was unprepared for the monumental task, and had to learn to think of others and accomplish many feats during the Civil War (War Between the States), a very trying time as the Yankees invaded Jacksonville four times. 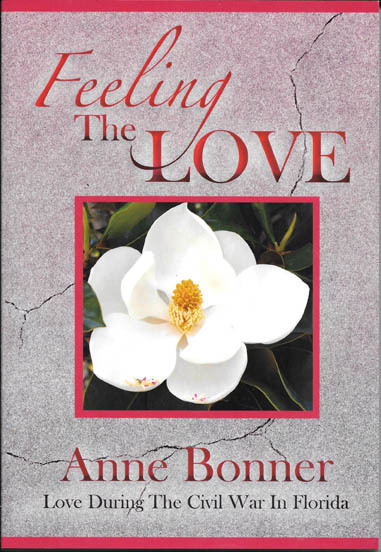 This compelling love story is about a Southern maiden, facing adversity and surviving a long debilitating war. Did Bessie finally conquer her inadequacies and emerge from her cousin's shadow to find love? What happens when she decides to seduce the handsome cowboy at Pinecrest? Could she love the enemy? How did Bessie handle the true test of "feeling the love" at the end of the war when confronted with an unexpected surprise? If you are a history buff, like suspense, and love a good love story, this book is a must read! ANNE BONNER is a fifth generation Floridian, growing up in Cocoa, and although she lived all over the world with her USAF fighter pilot husband, she was glad to return to her roots. She attended the University of Florida, where she was a majorette with the Fightin' Gator Band and a member of the social sorority, Alpha Chi Omega. Anne has recently taken up oil painting, which she enjoys very much. A lover of flowers, she was honored to have been chosen to be on the Hawaii Federation of Garden Club's committee to arrange the flowers for Washington Place, Hawaii's governor's mansion in downtown Honolulu, when Mrs. Jean Ariyoshi was first lady. She was also honored to have been awarded Gardener of the Year Award. Anne is a member of the Florida Historical Society, Cape Canaveral chapter of the NSDAR, Cape Canaveral Lighthouse Foundation, National Poets Association, Cape Canaveral chapter of the National League of American Pen Women, and served on the Board of the Space Coast Writers' Guild. Anne has written nine books in nine years and plans to finish the tenth this year. Perhaps the biggest project will be her memoir for her children.